I sit and I stare at the screen and I look at the TV and I realise an hour has gone by and I stare at the screen some more and I write some words and then delete them and think I’ve been writing for an hour, time to stop. I don’t get a lot of time to write and have spent so long writing during my lunch break at work, I think I write better under pressure. So I have my lunch while I’m working in the lead up to noon. Then I open Onedrive and my current work in progress (Dorthy at the moment) and do my best to write for half an hour. On an evening, I know I should keep the TV off and my phone away, but I seem to work better knowing I might be interrupted rather than in a relaxed environment. In the main, I don’t plot. I just write and see where it goes, though I have a rough plan in my head. Well, usually. Sometimes I don’t at all and am completely surprised (like the time I sat down to write some of the sequel to Sin and ended up with Rudolph Saves Christmas). Since I’ve worked on movie campaigns for Wattpad, however, I’ve started doing some outlines. I know where Dorthy will go and I have an overall plan fro Red Queen. But, to a certain extent, I find it a little restrictive as I am almost forced into what I’m writing. I still don’t fully plan the whole story, but it’s sort of a general route. I just need to decide if I’ll follow it. Either way, writing is a part of me. It’s like something trapped within me is trying to get out through my fingers. It’s something I’ve done since being a young boy – and been derided for through much of my life – and it’s something I can’t imagine not doing. What inspires me to write or what inspires my ideas? I wonder. So, ideas can come from anywhere and everywhere. And anyone (so watch out!). What inspired me to become a writer? I don’t know what started me off, as it’s something I’ve done all my life. The reading of To Kill a Mockingbird by my English teacher, as I’ve said many times, was what made me want to actually be a writer rather than just writing. I wanted people to be lost in my stories. I wanted them to be on the edge of their seats. The fact that, it appears, I seem to have achieved this, at least to some extent, is amazing. Being a full time writer IS my dream job! That’s probably a cliché but I so wish I could. I might finally have time to finish some of my works in progress for a start, instead of jumping on the next shiny new idea and leaving them hanging. Of course, when I was younger, even though I wanted to write and be a writer, my dream jobs were astronaut or archaeologist. Sin derives his name from the Singularity Point of a black hole and I would stay behind after class, with a fellow pupil, to be taught about carbon dating from our teacher. I wanted to space walk. I wanted to discover a new breed of dinosaur or hidden Egyptian tomb. I didn’t end up with either of those, but it’s not too late, I hope, to be the full time writer. I think the most important thing…well there’s more than one. Let’s see. Don’t write because you want to be rich. Or famous. You may well not be disappointed, of course. It could be a case of move over, J. K. Rowling, there’s a new voice in town! But, for me, writing shouldn’t be about that. For me, you should do it because you love to. You enjoy crating new worlds or inventing new characters and spinning them off into impossible situations. The words fill you. They leak out of you and puddle on the ground at your feet if you don’t get them down on the page. Don’t let other people stop you either. If you want to be a writer, then be a writer. It’s not stupid. It’s not a waste of time. If the only people who ever read your book are you, your other half and your mum, then so what? It doesn’t matter, do it anyway. If the words, the voice and the unstoppable impulse are there, then let them out. I’d also say, read as much as you can and write your heart out. It’s the perfect way to hone your craft and improve. By listening to others, you’ll find new ways to create your own stories. One book would be Neil Gaiman’s Ocean at the End of the Lane. It’s breathtakingly good. Its pages are filled with such inventive, wonderful ideas. I wish, one day, I could write a book like that. I’d also have Stephen King’s On Writing. If you haven’t read it, the book is a memoir of Mr. King, along with some brilliant tips and advice for budding authors. It’s invaluable and, I’m pleased to say, I’ve just this week bought myself a new copy. What else… Well, the first book (or rather, series) that I reread was David Eddings’ The Belgariad. It’s a fantasy tale of a young boy, Garion, who grows up on a farm with his Aunt Pol. He discovers that she’s a witch and the crazy old man who occasionally visits is a wizard. Many exciting adventures ensue, of course. I’ve read the full series, including follow on books, multiple times, but not for many years. I think being stranded us the perfect reason to revisit it. I have to include To Kill A Mockingbird. I owe the novel so many things. It’s an important, moving story and Mockingbirds feature in one of my tattoo. I’m missing far too many out, but I’d never stop. I have loads of Wattpad friends and extended family who have created stunning works that I’d love to include. Children of the Plague. White Stag. Hide and Seek. More, more, more! It’s an impossible task! Sanctuary can be found in the most unexpected of places. A mother’s arms, or an aunt’s, during a particularly scary film. A doorway in the rain. A dark room when a severe headache makes you want to rip your head from your torso. A sofa with your favourite Gregory Peck black and white movie, a thick blanket and a large tub of cookie dough ice cream. A tall, yet crumbling building, with one wall lost to time and elements. Windows had forgotten what glass was in the years since they were filled. The door had opened only three times in the last decade. Since then it was stuck shut on hinges that were rusted and cracked. Any attempt to pull it open would result in the hinges breaking and the door dropping and sticking in its frame. Once upon a time, the building wanted to be a castle. The builder of the building, Francis Oberon, also wanted it to be a castle. Funds and materials had other ideas, however. By the time the beginnings had begun and were progressing to the middle of the project, the grand designs had to be made less so. Francis lived alone in his home, telling himself daily that he was still happy with the finished product. He hoped that repetition would result in conviction. By the time that, alone, he passed away, it hadn’t. He still longed for the extended boundaries that would give him the room to feel the echo of his loneliness. The more compact living situation, though still extensive, didn’t allow him to enjoy his empty life. Though others would be sad at such a state, he wasn’t. He found solitude to be a generous companion. It gave him time to think. Time to sing and dance. Time to be alone with himself and his collection of alternate personalities. He knew they weren’t real. He knew they were, perhaps, aberrations of his mind. He didn’t mind. The castle would have given each of them a room to themselves. They had to double up when the original plans went awry. The man, without his imaginary other identities, died in the only chair he owned. It was, apart from a single bed, the only furniture he had, or felt he needed. Imaginary friends required only imaginary belongings. When Julian took shelter in the tall, crumbling building, the remains of the man still sat in the chair. The upholstery had faded. Various birds and rats had made nests and lairs in its stuffing. His bones were mostly intact. A fox had made off with a femur and most of the toes had fallen off and rolled off along the slight slope inherent in the floor. Julian stood in front of the man. The boy, or his remains, looked down. A part of him wished he could swap places. He didn’t want to be who he had become. He wanted free of the curse the Terrors’ bites had inflicted on him. He would rather be bones than beast. But he wasn’t and he had to deal with the conflict that was creating in him. And what else it was creating. Dorthy is still going strong. Before I return to Red Queen, Mortal Sin and so on, I am determined to finish this book. I don’t think I’m far off to be honest. I can taste the end! I’ve relaunched my website! YAY! Drop by and take a look! I think it’s cleaner, more fun and more informative. Let me know what you think. Also, there’s a surprise story coming up. It’s only short, but it’s exciting – I have to keep it quite for the moment, but you’ll find out all about it soon! BOBM!!! That was the sound of my mind being blown to tiny scraps, i mean what glorious and invaluable insights, and what ambitious, rib-cracking/guts-busting extensively halirious man you are, Sir. 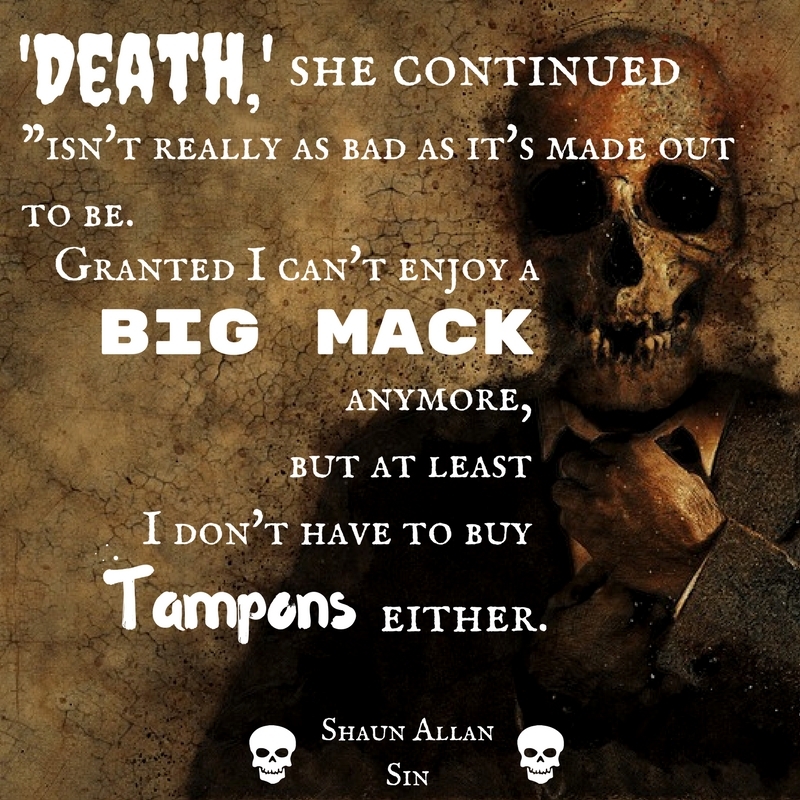 Shaun Allan, indeed, i do write, but not very often, but i will be damned to forsake writing, and after i read this, i will be damned twice, we love you writing, man, keep on doing that and may you never cease to amaze?